Reviewed by Chris Arnsby. 15/12/1983. Simon Bates: "Thursday night on BBC1. Welcome to Top of the Pops. With some familiar faces." Janice Long: "We're going to have a great party time tonight starting at number 25, it's Status Quo and Marguerita Time." Status Quo: Marguerita Time. Bad news. This is a pre-recorded episode of Top of the Pops so Simon Bates won't tell us the time. However, he does helpfully namecheck BBC1 for any viewers whose TV set is missing a channel tuning knob. 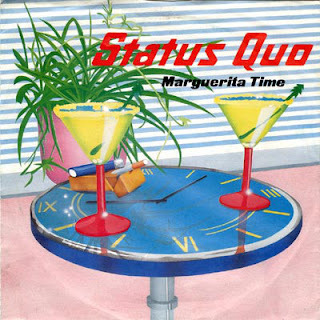 Marguerita Time is the song that reveals Status Quo don't know how to spell Margarita but, more than that, it's also one of those rare Status Quo songs that doesn't sound like other Status Quo songs. (Fact John- Actually you can spell it either way according to Googlepedia. I think in this case it’s a cocktail. I can’t really imagine der Quo drinking cocktails though, it'd be more like Brown Ale Time) It joins Pictures of Matchstick Men, Living On An Island, and In The Army Now in a small pile vastly overshadowed by Status Quo's 3,623,217 other songs which all go dun-der-dun-der-dun-der-dun. UB40: Many Rivers To Cross. The promo film. Slade: My Oh My. Slade are in the charts twice. Merry Christmas Everybody is currently lurking down at number 35 for its 1983 rerelease. Slade have bought scarves for everyone in the studio to wave. They have Slade written on them, obviously. Director Gordon Elsbury (Michael Hurll is away for Christmas) forces Simon Bates to hold a Slade scarf but Simon Bates is incorruptible. He is sickened by crass attempts like this to curry favour with the audience. Observe the scornful way he holds the scarf and then throws it over the side of the balcony as soon as his introduction is over. In fact the balcony seems to be a bit of an anti-Slade zone. At the far right end, just behind Noddy Holder, is an incredibly bored looking teenager. She and a friend each have one end of a Slade scarf and they give it a few desultory waves before the whole thing becomes too much effort. Maybe they're Status Quo fans. Or maybe they're less than impressed by Noddy Holder's theory that a women needs a man and you should "try and catch one if you can." Barry Manilow: Read 'Em & Weep. Status Quo? Slade? Barry Manilow? What is this, back to the seventies night? Why Gordon Elsbury you are spoiling us this Christmas (1983). Could we also have The Dooleys or the Brotherhood of Man or Laurie Lingo and the Dipsticks? Anyway, Barry's on video. Pretenders: 2000 Miles. In 1983 a pop song could get you 2000 miles, by 1988 inflation had reduced The Proclaimers to a mere quarter of that figure. So much for Thatcher's economic miracle. The Flying Pickets: Only You. Last week The Flying Pickets came dressed as the vaguely six Doctor Whos; there's the vaguely Tom Baker one, the Delta and the Bannermen one, the very vaguely Jon Pertwee one, the vaguely David Tennant one, the one that sort of looks a bit like Sylvester McCoy if you squint, and the vaguely Richard O'Brien one. The Flying Pickets have eerie powers and can see into both the future of Doctor Who and a parallel universe where the ironically named Green Light actually got their 1990 film made with Richard O'Brien.Sorry, I lost the thread of what I was writing there. 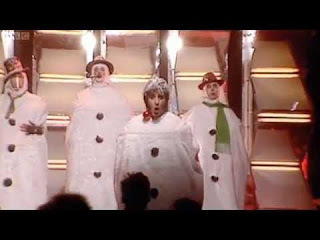 This week The Flying Pickets have come as snowmen. They "melt" at the end of the performance. Kool & The Gang: Straight Ahead. The crowd dance and look happy. This is surprising considering some of the grim songs they heard tonight. Still they did all get Slade scarves. 22/12/1983: John Peel: "Hello fans and welcome to another live Top of the Pops. As you can see, because it's the Christmas season, we're all dressed up in fancy dress. I like yours." David Jensen: "Thanks very much. We've really gone all the way for this one and we're going to kick off in a party mood with Slade and Merry Christmas Everybody." Slade: Merry Christmas Everybody. Michael Hurll has found a couple of quid under the Top of the Pops sofa and paid to have a seasonal adjustment made to the opening titles. The magic of CSO -or possibly Quantel, I don't know- is used to add Christmas baubles behind the screen when it explodes at the end of the titles; and there's a special Christmas 1983 logo; and a big Christmas 1983 sign hanging from the ceiling. Today this would be part of a branding exercise across BBC1 to make a consistent Christmas theme. In the glory days of 1983, when branding was something that happened in Westerns, it really just seems to have been Michael Hurll's whim. The BBC1 Christmas ident that year was a garish mechanical snowflake. Slade meanwhile kick off the show with the tenth anniversary rerelease of Merry Christmas Everybody which reached its chart peak here at number 20. Please don't confuse the 1983 rerelease with the 1982 rerelease which peaked at number 67, or the 1984 rerelease that only got to number 47. Or indeed the releases in 1985, 1986, 1989, and 2006. It wasn't until the 2007 rerelease that the song got into the top 20 again; possibly just on sheer persistence. Culture Club: Victims. Another chance to see the video. Tears For Fears: The Way You Are. "The worst thing we've ever done." © Curt Smith. Smith's curt comment aside, the public seemed to like the song and it's going to continue up the chart for a couple more weeks. Does this unwanted Christmas present mean Tears For Fears have been naughty or nice? Billy Joel: Tell Her About It. On video. 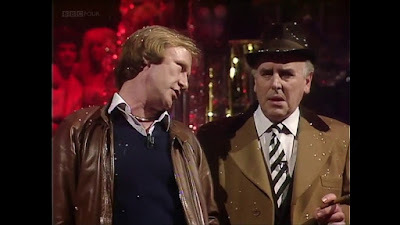 Dennis Waterman & George Cole: What Are We Gonna Get ‘Er Indoors? Orange alert! It's a novelty Christmas song. And, worse than that, it's a novelty Christmas song from the other side; ITV! And, worse than that, it's one of two novelty songs from ITV in the chart this week. Did Michael Hurll pause at the idea of promoting Minder? It was one of ITV's top dramas and, at this point, about a year away from it's peak rating of 16.4 million (according to Wikipedia). What Are We Gonna Get ‘Er Indoors? 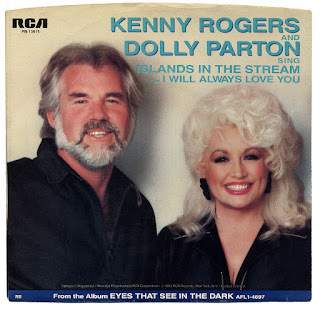 was released on 10th December, the same week The Way You Are first appeared on Top of the Pops (08/12/1983 edition). Since then What Are We Gonna Get ‘Er Indoors? has climbed from 97, to 52, to 26 while Tears for Fears least favourite song has shot up a mighty three places to earn a second performance. Shenanigans or coincidence? I suspect there might have been a certain amount of diplomatic ignoring of What Are We Gonna Get ‘Er Indoors? until it entered the top thirty, and at that point it had to be featured. And here it is. George Cole and Dennis Waterman have left behind the forbidden Thames postcode of NW1 and crossed the Glienicke Bridge to W12 and Television Centre. George Cole's microphone doesn't seem to be working during the introduction or is this BBC sabotage? A lot of the banter seems to fall flat, but there's genuine laugh from the audience on the exchange "isn't that carol singing?" "yes I wish she'd stop", and a round of applause at the end. 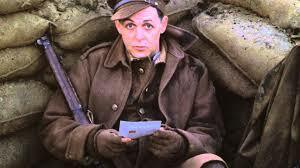 Paul McCartney: Pipes Of Peace. On film. Yes film. None of this cheap video for Mr McCartney. There's an awkward live TV delay before the promo starts. David Jensen says "we're going to join him in the trenches for Pipes of Peace" while John Peel alternates two silly expressions. Then there's a three second pause and David Jensen starts vamping. "Coming up now," he says before turning to John Peel and saying "one of your favourites I know," while Peel continues pulling faces. Let's hope Paul McCartney wasn't watching. Howard Jones: What Is Love? The second of three songs tonight with a question mark in the title. Is this significant? Roland Rat Superstar: Rat Rapping (Brilliant Isn’t It?). ITV novelty Christmas song number two. The saviour of TV-AM released his single six weeks ago, and this is the first time it's been featured on Top of the Pops. Hmm. Maybe Michael Hurll was more afraid of the wrath of Frank Bough and the boys and girls from Breakfast Time than he was of the BBC Drama department. The Top of the Pops audience are unaware of BBC internal politics and dance happily into Christmas.